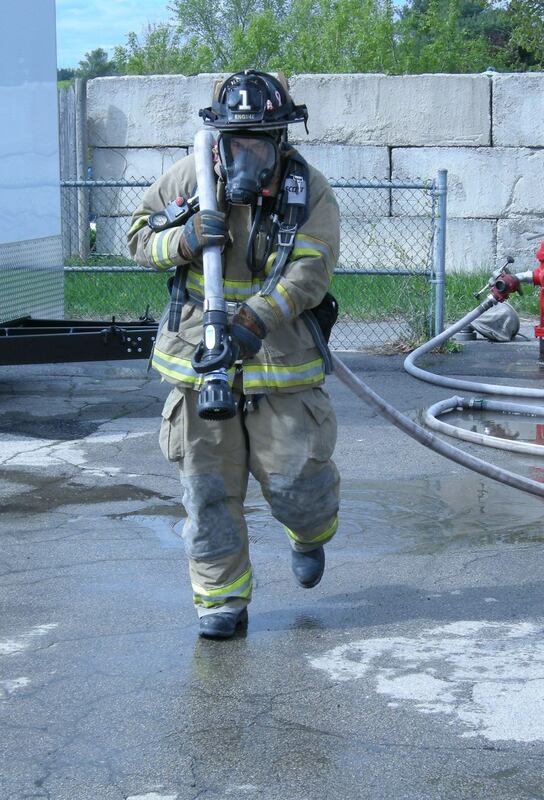 With warmer weather approaching, Derry firefighters are again making sure they are ready for action – which includes being able to fight fires in sweltering heat wearing protective gear while lugging around heavy equipment. Annual duration testing is a practice that helps firefighters determine how long their Self Contained Breath Apparatus (SCBA) air supply lasts while performing a course of simulated firefighting tasks. SCBA and thermal protective clothing have a combined weight of 55 pounds, which significantly adds to the work load of fighting a fire, according to Derry Fire Battalion Chief Jack Webb. Testing rigors last week included climbing ladders, using sledge hammers, carrying equipment, dragging hose lines and involves upper body, lower body and core muscle groups, all while working at a pace and effort similar to an actual structure fire. While performing these tasks firefighters are focused on proper breathing techniques, and must monitor their own air supply gauges. Annual duration testing is part of the National Fire Protection Association (NFPA) and the National Institute of Occupational Safety and Health (NIOSH) standards on Self Contained Breathing Apparatus. More importantly, Webb said, duration testing helps train firefighters on their limits and the limits of their SCBA.